Communication is an impacted major at SDSU. Students can only be admitted to the pre-major, and will be restricted from taking certain classes available only to majors, until the impaction criteria are met. Transfer students must meet the impaction criteria. Complete general education oral communication requirement (3 units) and two courses (6 units) selected from Communication 160, 201, 204, and 245, each with a grade of "C" or higher and an average grade of 2.75 or higher. These courses cannot be taken for credit/no credit (Cr/NC). Complete a minimum of 45 transferable semester units and a maximum of 90 semester units. Have a cumulative grade point average of 2.75 or higher. 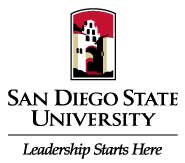 To gain entry into the major, students must fulfill the pre-major requirements described in the catalog in effect at the time they declare the pre-major at SDSU (assuming continuous enrollment).